Never say never and watch where you put your feet were pearls to grow up on. Traversing the stairs in an old auto body shop up onto coral-coloured floors your eyes take a moment to reflect. The sisters Anderson have an amazing ability at making art comfortable yet full of teeth in the Jody Monroe Gallery. With seemingly little effort. But you know that’s not true after talking to either for a moment; vision, drive and an articulated sense of high/low-brow art pour from their lips. 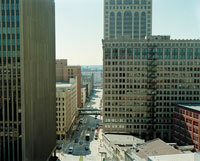 Their current show (through October) of the photographs of Peter DiAntoni and Paul Druecke is very dense; first you’re slammed by Peter’s large intense portraits of Milwaukee city-scapes hung in a smallish room. Thru a doorway and Paul soothes the savage beast, in an almost sweet yet grand vision of Milwaukee. If you haven’t made it to Jody Monroe for this show, do so. Look and wonder and drop some bucks. Lucky are we to have galleries such as this.